We regularly receive requests for guidance on how to change a will. Changing a will is very straightforward, but there are a number of ways to do it depending on your situation and which we will explore in this guide. There are a number of ways that a will can be changed. When it comes to amending a will, the way in which you change a will depends on whether you are looking to change it before or after death. If you are looking to change your own will, then no doubt you are alive and accordingly you can change your will yourself either (a) using a very short document called a codicil or (b) by making a fresh will. On the other hand, if you are looking to change someone else’s will, you can do this after their death using a deed of variation. We look at each of these in turn in more detail below. A codicil is a short addendum that forms a separate document from the original will, but which is added to the original will, and stored with it. It modifies one or more parts of the original will and the rest of the will still stands. If the changes to be made to a will are minor, then it is usually preferable to implement the small change using a codicil, rather than incur the time and the cost of getting a completely new will written up. A Standard Codicil Template – this is our general codicil template that enables you to implement any change that you want to your will. A Codicil to Change Executor – quite often the change to be made to the will is simply to change one or more of the executors. Since this situation is so common we have edited our standard codicil template to cover this exact situation. A Codicil to Leave a Gift to a Charity – this version of our codicil has been edited so that it covers the situation where you want to change your will to add a gift to a charity. If you want to amend something else in your will, please use our standard codicil template. If you want to make a lot of changes to your will, it is usually easier to redo the whole will from scratch, rather than amending various parts of it using a codicil. You can make a replacement will in this way with any of our will templates. To see the full range of our will templates, click here to find the one that best suits you. A deed of variation (or a Deed of Family Arrangement, as it is often referred to) is the document that needs to be used to change a will after the death of the person that made the will. In this situation, the will can be changed by the affected beneficiaries, with the help of the executors. Frequently, people ask us the question ‘can an executor can change a will?’. The executor can change the will, but the change will only be legally binding if it is in writing (which is why you need to use the Deed of Variation) and it is signed by each of the beneficiaries that is affected by the change. We have a more detailed guide on how to do this and what other requirements apply: find it here. You can find our Deed of Variation for a Will template here. Having read this guide, you should now be familiar with how to change a will and the different ways in which that can be done. 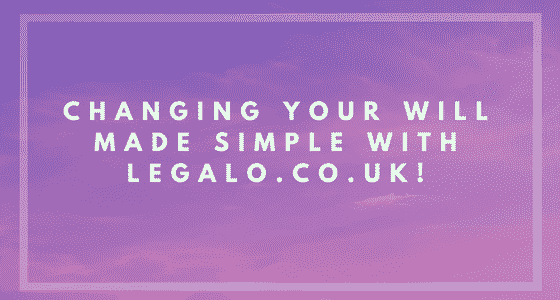 Our templates can be used for changing a will without needing an expensive lawyer – they each come with a guide to make the process very simple for you. We also offer free telephone and email support for our templates if you do have any queries on when or how to use them. Using any of our templates, you will save hundreds of pounds on the cost of using a high street law firm to do the same job for you, when you really have no need to use a solicitor in order to create a binding, valid, legal document in any of these cases.